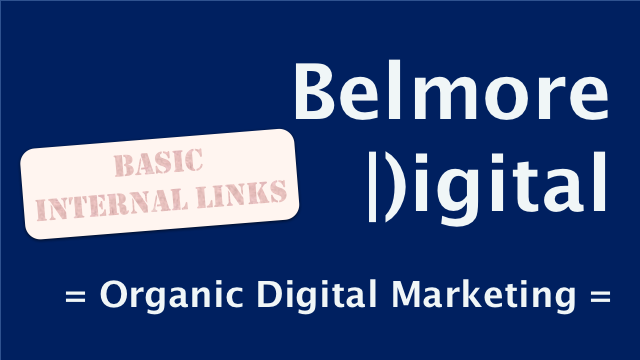 This page gives an introduction to basic SEO internal linking – that is linking to pages within the site. This should be done for information architecture, usability and optimisation reasons. Help the user and search engines to understand the structure of the site and their current location on site. Often used to navigate back up the tree – users find them really useful. Where possible, use the brand rather than home for the first link, this is an easy brand win. Use structured mark-up, which really helps search engines to understand a page’s position in the hierarchy and relation to other pages on site. In terms of faceted navigation, it can be possible to use two or more breadcrumb sets, although real care must be taken not to confuse the user. The current page can be linked or unlinked, and bolded, if desired. My preference is unlinked, as it’s not needed, and bolded to make sure the user knows where they are. The breadcrumb labelling for each page should be closely linked, or related, to the primary H1 heading and the Title tag. Ideally your CMS would allow for a difference between Title / H1, URL, Breadcrumb Label and main Navigation Label. Ignore any person in a build project who think breadcrumbs are unnecessary. Header navigation provides the main way of navigating to sections or pages within the site. It provides an easy way to surface links in a chosen order. It provides an easy way to use relevant keywords in link labelling. Header navigation transfers some link equity to the destination page. Care and thought should be used when constructing your header navigation. It does not need to contain every URL on site. Your search priorities should match, the priorities of your user, which should relatively naturally fall to “sections” or topics which can be used for dividing up the header navigation. It also needs to take account of whether your user is accessing the site on mobile, tablet or desktop – flyout panels on hover should really only be used with a mouse. Link labelling should be closely related to the destination page’s Title / H1 / main topic. Use keywords, but use them judiciously. There is no need to have a long list of “red widget” links. Order lists by a mixture of search priority and user priority – which should be closely matched – rather than alphabetically, or by page creation / database ID. Ideally, lists of links should have between 5-7 components, with a “more ” link for expansion. Big lists tend to cause confusion and “word-blindness” in users. In-body links allow you to link directly from one piece of relevant content on a site, to another relevant piece of content. In-body links are a great way to pass significant amounts of value to a destination page, because the relevant, contextual content usually surrounds the link. Users love them, if they are relevant and useful. In-body links retain users on site and encourage further page views. Link keenly within articles on-site, but try not to litter. There is no hard and fast rule about how many / how often. If a link is useful for a user, it has value. If it looks like spam with an article being constructed from poorly strung together links to other pages, then it generally would be seen as spam. The more links you have the less value goes to each link. Use keywords for link labelling, but don’t always link directly to one page using its primary keyword, which should be used in the H1 or Title Tag of the destination page. Use natural variations, related terms, even dreaded inanities like “click here”. Relevance of page-to-page content and context will always win out over placement. Don’t be afraid to link to old pages, or link from old pages to new pages. Where possible, the link is better placed in body text than in a sidebar, or a related link call-out. Sidebars, like the inestimable WordPress uses, are incredibly useful for users and search engines, as well as for sectional architecture. Generally, they are useful for surfacing links to pages within the same section, which may not be in the main navigation. They are also useful places for Recent Content, Popular Content, Key Content. Use sidebar links to link to sectional content, especially if those links are not in the header or footer navigation. They are close to the body content and have higher relevance and value over header or footer links. Use the primary keywords, as peer the H1 and Title Tag of the destination page where possible. As per header navigation, avoid lists of repeated keywords where possible. Use an H3 / 4 Heading with the keyword and generics as the linked terms. Use sidebars for also moving users around the site to fresh, popular or particularly important content. As content gets longer, don’t be afraid to have a lengthy sidebar, although if you have short content, then a lengthy sidebar is much less appropriate. Footer links sit at the bottom of the page and divide into two types: footers and sub-footers. Footers tend to have useful information for users and search engines within them. They may vary by section of the website. Sub-footers tend to be sitewide and will often link to hygiene pages. They are useful for optimisation and usability. As general rule, most footers tend to be sectioned differently to Header navigation. They tend not to repeat all the links in header navigation. Preference is always to have a footer panel open rather than collapsed. If you collapse the panel, you probably have too many links in it. Thankfully, the design fashion for mega-footers appears to have mainly passed. Generally, footers pass less value than any other linking area on the page. As per header navigation, use keywords related to the destination page title and H1, but avoid overly repetitious usage of keywords. They can be very useful for linking to Key Content, Recent Content and Popular Content. They are also very useful for linking to (or including) user experience pages, like Contact, FAQs etc. Sub-footers tend to be used to link to Privacy / Terms / HTML Sitemap pages. In-page links are an incredibly useful bit of linking. They link to another point on the same page. Use them to navigate or refer a user to another section of a page. They enable better sectioning of pages and allow for useful in-page navigation – which is very handy for mobile users with no scroll wheel. Used wisely, these can help to give a page good structure, or in-page referencing, and can really help with optimisation and user experience. Use keywords related to the section you’re linking to, but again, be sensible about the usage of them. For example this link to the Header Navigation section will take you right back up there. Handy, no?